South Indian composer Yuvan Shankar Raja has entered wed-lock with Zafrun on New Year day, January 1st. Apparently, he informed his family just two days before his wedding, and Bhavatharini, his sister, was the only one from Yuvan's family who attended the wedding. Confirming the news of the wedding, Bhavatharini told us, "Yes, he got married on January 1. It was held in a beach house in Keezhakarai, which is the girl's native place. It seems he planned it suddenly as he informed us only a couple of days before the wedding. I had to cancel my New Year plans to attend the wedding. His cousin and I were with him on his D-Day." Ask her if their dad, the legendary Ilaiyaraaja, had been informed about the wedding, and she says, "Yuvan called our dad, too, but as dad was not in town, he couldn't attend the wedding. I think dad had told Yuvan that he would meet him later. Yuvan has always been like this since childhood; if he feels right about something, he will do it immediately." Reports say that Yuvan has changed his name to Abdul Haliq. Has he? Bhavatharini clarifies, "For the marriage, he changed his name. But as a music director, he will be officially called Yuvan Shankar Raja only." Zafrunnisa is a Dubai-based designer and according to Bhavatharini, this is an arranged marriage. "Yuvan wanted to get married to a girl from a Muslim family. He had asked his friends to find a suitable match for him. His friends in Malaysia looked for a suitable alliance and arranged this wedding. Yuvan's happiness has always been the family's first priority. He looked happy at his wedding, and that's all we want," says Bhavatharini. 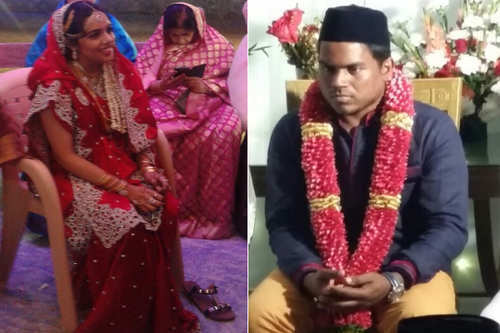 Yuvan Shankar Raja who embraced Islam last year, changed his name as Abdul Haliq and married Malaysian fashion designer, Zafrun in tradition Isalm style yesterday. Masss, Yatchan, Thani Oruvan are some of the awaited music albums of Yuvan Shankar Raja.